Ever experienced being grounded by you own parent only to find out that the terms of discipline had changed? Personally I never did but if you ask my kids, they will attest that such incident did not happen just once and that they are thankful they have my own mother to run for their rescue. Not that my mom meddled every now and then and even though my kids all grew up with her in the same household she had learned through the years when to let her presence felt and when to step back. Besides she knows how independent and hard headed her grandkids that taking a firm stand had helped a great deal in bringing them up with their feet planted on the ground. Contrary to my kids upbringing, my grandmother( my dad’s mom) had lived next door where I only get to see her mostly during afternoons after school and who only visited us when she watched her favorite Sunday TV Mass. My sister and I would fetch her favorite gardener, Cynthia, also a relative so she could water and take care of her plants This grandma of mine had a green thumb and had lots of roses and bougainvilleas, all lined up in pots. Funny what motivated me and my sister every afternoon to follow her orders was the incentive we got in fetching Cynthia, a ten centavo coin where we can get to buy our choice of candy. There was even a time that this grandma of ours gave me a raincheck for being included on the top five of my 1st grade class. A whooping 200 Php which I gave to my dad so he could keep it and just give me the money I needed each time I bought my favorite candy or bubble gum. On the other hand my mom’s mom we call Lola Oyang was the independent and proactive grandma who we only visited during school breaks. She chose to stay in her hometown where she grew up that we literally have to take two provincial busses and a ship to get there. And since traveling and having a vacation would entail a lot of money, we cannot visit her very year. I could recall visiting her place three times, the last one being the saddest as that was the year she had crossed over. My kids also never got the chance to see and be with any of their grandfathers and just like me, they grew up not knowing how it felt to have a grandfather by their side. Though they do have a grand uncle who they get to visit during Christmas, it never really mattered if they grew up without one. But there were days that they could not hide their excitement and longing when I told them stories about my dad, his lone brother who is still alive and who will return for a homecoming next year.They might have all grown up but the yearning could not be hidden especially with the knowledge that they still have a grand uncle that they would finally meet after all these years. At times I ask myself where all the excitement and yearning come from considering they were lucky to have grandmothers who took care and watched over them since they were kids. Perhaps it is the fact that one can never get enough of being loved, appreciated, affirmed, remembered and taken cared of. 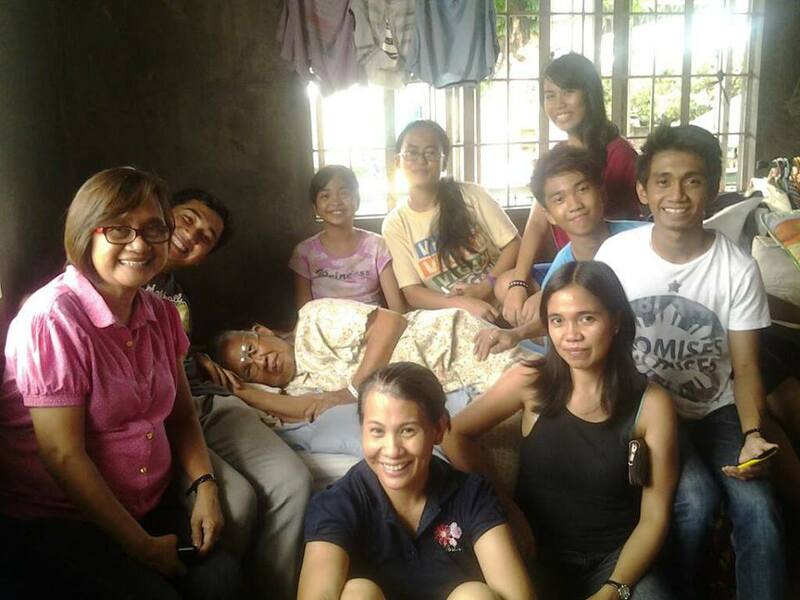 A feeling of home, belongingness, accepted and nurtured that one will always look forward at the end of the day. An unforgettable, unexplainable feeling that will always remind you of childhood and all the happy and good memories that went with it. An unending smile that lighten one’s face each and every time you think of them. You know what I think of people who have known at least one grandparent in their lives? I think of them as blessed. It takes a lot of undying courage and love to look after ones’ grandchildren despite the unending battle with age, illness and empty nest challenges. At times grandparents chose to live longer because they know they are needed still, that some broken pieces of their lives needed to be fixed still and they knew that making it up with their grandkids is their ow special way to heal it. This Sunday, September 8th is National Grandparents Day. Take time to greet them or any grandparent for that matter. A simple act like offering a seat, showing them directions, assisting them while they take the stairs mean a lot to them. One can never go wrong in thanking and remembering grandparents even in simple ways because they are such a blessing. Lucky are we who have felt such love from our grandparents. Posted in Uncategorized and tagged Christmas, Family, Grandparent, Home, Massachusetts, National Grandparents Day, Php, Sunday. Bookmark the permalink. I am a single parent who has seven kids, three of them have special needs. I blog mostly about the struggles and triumphs of parenting and motherhood, but topics like laughter, kidstuff, movies, music, friendships and family relationships also appeal to me. Aside from writing, I am also interested in photography and plans on studying even the basics of it. Life is full of different colors, but I would prefer living by looking the brighter side of it. I hope you do too.